Lincolnshire Curly-Coated Pigs, also known as the Baston Pigs or simply as the Lincolnshire Curly Coats, were an old breed of pigs from Lincolnshire, England. The breed became rare, and was finally extinct by the early to mid-1970s. Lincolnshire Curly-Coated Pigs were bred to be tough and hardy. They were large and had lop ears. Their most prominent feature was their long, curly white coat, which helped it to weather the damp, cold winters of the Lincolnshire fens. 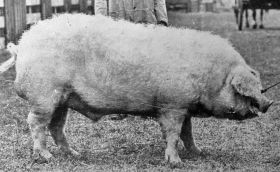 Lincolnshire Curly-Coated Pigs were one of the oldest breeds in the UK, and was formerly very common in eastern England. By the 1930s, selective breeding had developed its fattening abilities, and large specimens were exported to Russia and other countries. However, their numbers dwindled after the Second World War, mainly due to changing farming patterns and a taste for leaner meat. The last known specimens were kept by John Crowder, and the breed was lost in the early to mid-1970s.